For the Love of Beads is out to fulfill a mission: to provide you with jewelry supplies that you can use to create beauty, both for yourself and for the world around you. Run by two friends and their husbands, you immediately feel that there is a lot of love here to go around! You'll find a sense of humor on most every page too. One of the features that I really like about their website is that you can browse the collection by material or by color. When you browse by color, it includes not only the beads, but also stringing supplies! Smart thinking. A quick roll-over with your mouse will show you a close up detail shot of the product. In the glass beads section, I was happy to find that the beads are grouped by finish or technique. For example, all the beads with an aurora borealis finish have been grouped together. It's really nice to have options like this when you are browsing for inspiration. 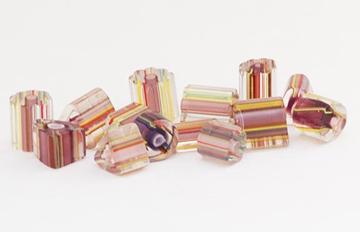 There are beautiful foil-lined glass beads too, including some that are bargain priced. 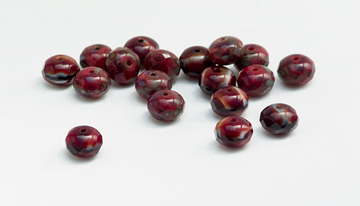 The Fire polished glass beads (see the image above and at the top of the post) include some very cool red givre donuts that I've not seen before. I do believe I need some of these! And I'm a total sucker for furnace glass, so I was happy so see some nice choices here as well. 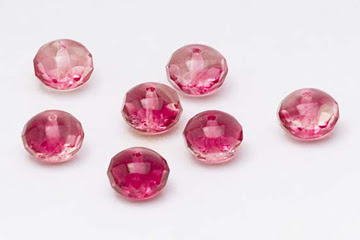 Don't miss the other categories of beads either: there are interesting African trade beads, different metals, gemstone beads, wood, clay, pearls, and more, plus your stringing supplies and findings. I'm really interested to find out more about a new product that they will be carrying soon called "Vegan Ivory". Since only vintage ivory is legal to use in the US, this could be a welcome substitute. As regards FTC disclosure guidelines: I have been paid for my review as it pertains to this site. You have my pledge that I do not ever review products or services that I feel are not a good value.